You are at:Home»Frontend technology»Setting environment variables using Gulp. Setting environment variables using Gulp. For the project I am working on we have three different environments, which have their own database and users. We don’t want this login credentials to be in our git repository, and we also don’t want to manually adjust the credentials every time we do a release to another environment. One of the solutions of using environment variables is using flags. (e.g. gulp build –prod and gulp build –local). But with this option the variables should be set in the Gulp file, and thus in de repo. Also, we don’t like the idea of using flags, a build should just be build with one command, no matter the environment. We also need to change the variables for the environment, in every environment if we do a git pull since the variables will be overwritten by the pull. The solution we came up with makes use of gulp-replace-task. This plugin allows us to use placeholders in the source code which we can replace with the actual database connection data when building the project. We have a configuration file somewhere on disk (configProperties.json), which contains the database connection information. This file exists in every environment we have. In our config.ts file we have the placeholders where the data should be. Notice that the name of the placeholder and the name of the objects in the json in the configProperties.json are the same. This is because gulp-replace-task will map it for us. Since we use typescript, and made a type for the connection, we can still use the autocompletion in the rest of our source code. In gulp we made the following method using the gulp-replace-task. This maps the objects in the json to the placeholders in the code, and replaces them in the pipe. We can now use this function in our build task. After this you can do whatever you want, in our case we typescript-compile our source code and write it to the dist directory. 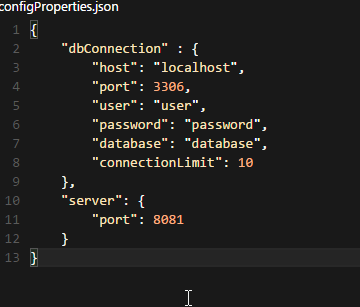 The compiled config.js now contains the database connection data which was in the configProperties.json. All we have to do is set up a configProperties.json file in every environment and do a gulp build to make the code use it. If, for example, the password changes in the production environment, we can change the configProperties file on the production environment. Cindy studied Software Engineering in Amsterdam. After university she starting working as an ADF developer at AMIS. Then webdevelopment happened and has since been the main focus. When not coding she is stopping balls as a goalkeeper. Cindy studied Software Engineering in Amsterdam. After university she starting working as an ADF developer at AMIS. Then webdevelopment happened and has since been the main focus. When not coding she is stopping balls as a goalkeeper.